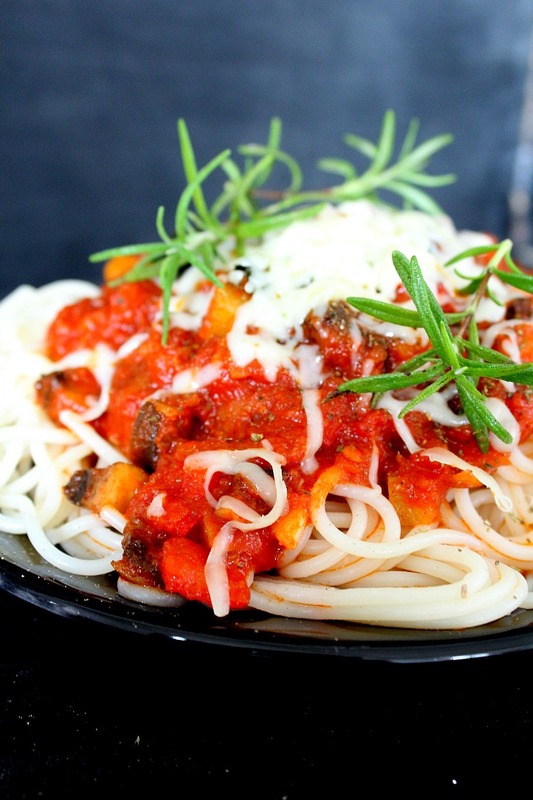 Ever wondered how to make chickpea pasta? 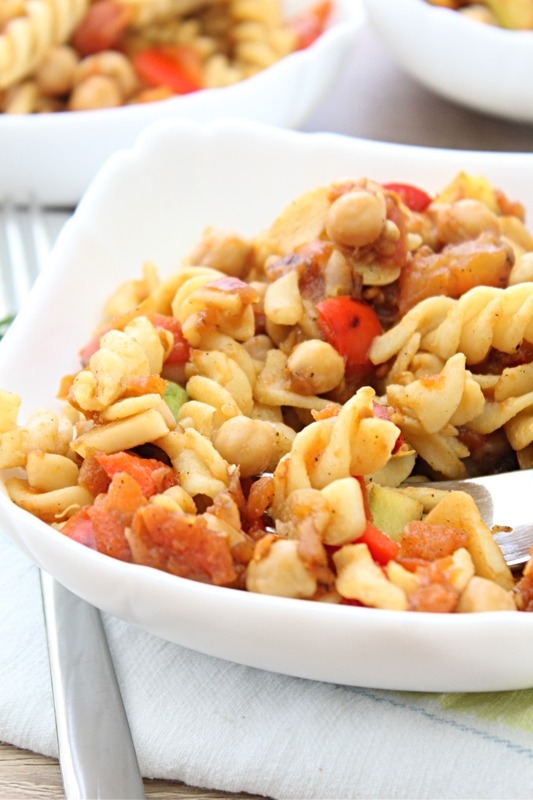 This yummy-in-my-tummy chickpea pasta recipe is easy peasy to make, nutritious, filing and scores pretty big on the healthy factor! 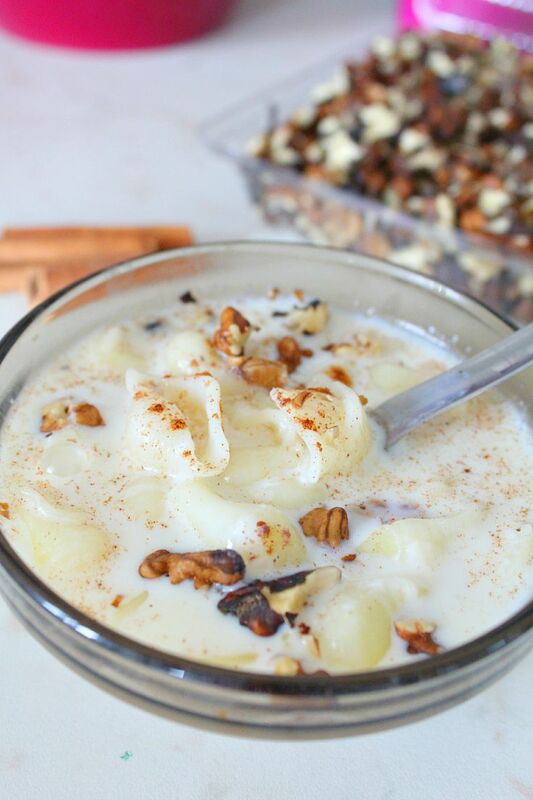 If you’ve been on the lookout for delicious ways to add more healthy foods to your diet, look no more! 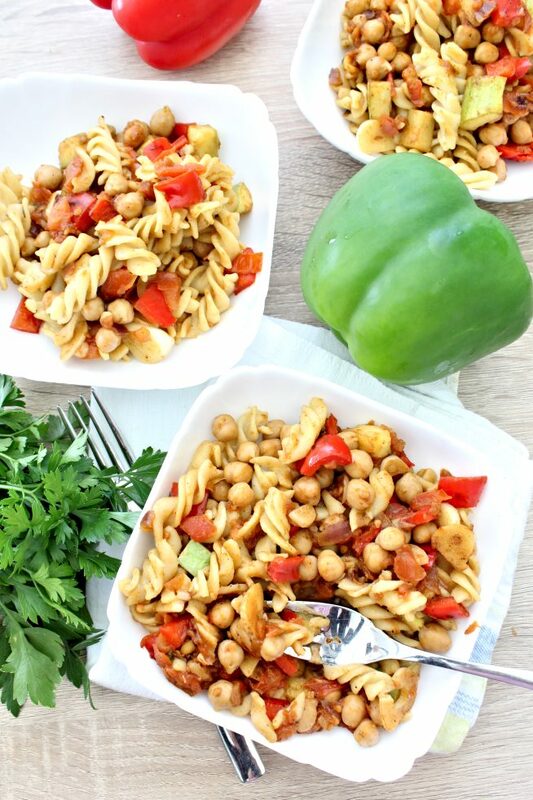 This chickpea pasta recipe is not only ultra quick to make and full of flavors but scores high on the healthy factor too! 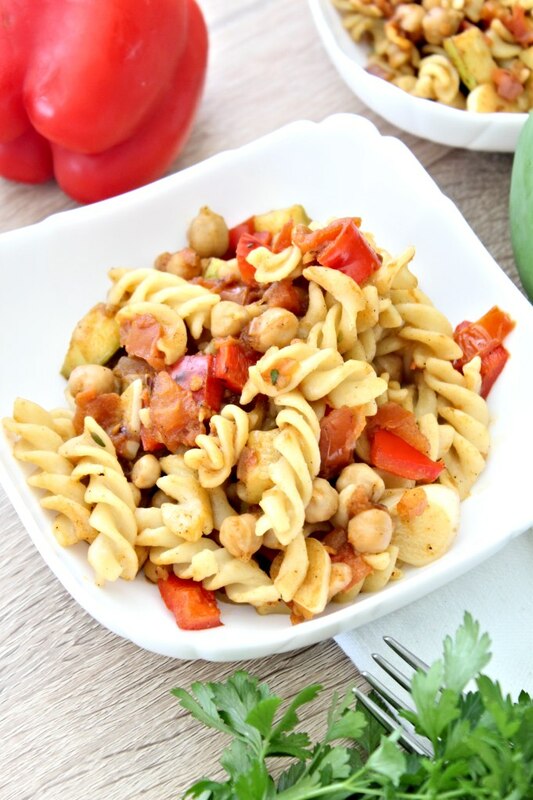 I made this tomato chickpea pasta as part of my new healthier lifestyle regimen I started a while ago. 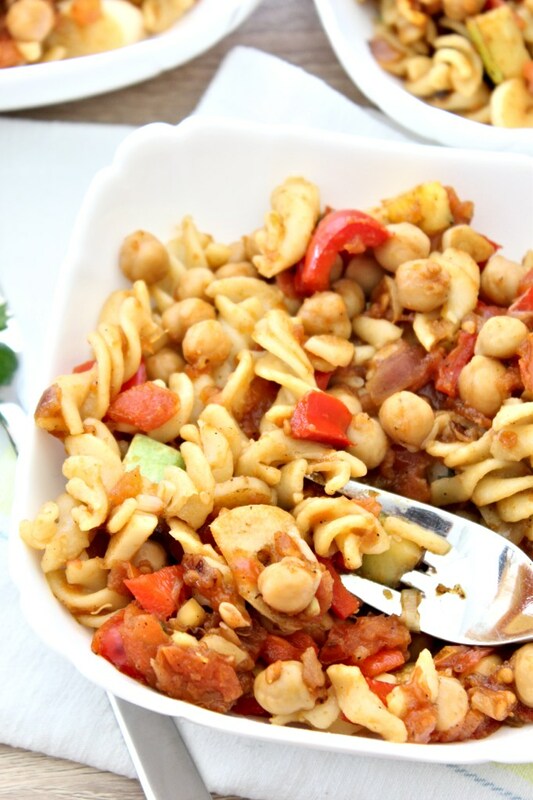 I wanted to make this chickpea pasta recipe an easy, quick, light but filling dinner idea. 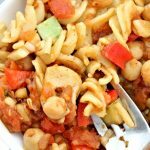 This lovely chickpea fusilli is super great when served fresh but you could easily make it in advance and re-heat it in the microwave or the oven; it tastes just as wonderful! Heat 2 tablespoon oil in a large nonstick skillet over medium heat. Add pasta and cook, stirring often, until slightly brown. Transfer to a bowl and cover to keep warm. Add the remaining 2 tablespoons to the pan and saute onion pepper and squash. Cook, stirring occasionally, until crisp-tender, about 3 minutes. Add garlic and fresh thyme and cook for until garlic starts to brown. 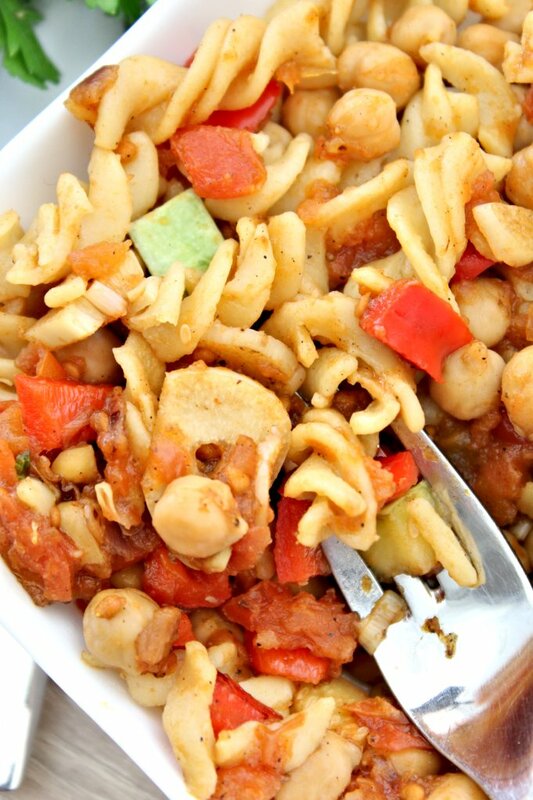 Wash chickpeas and pour over the veggie then add canned tomatoes; cook, stirring, about 3 minutes. 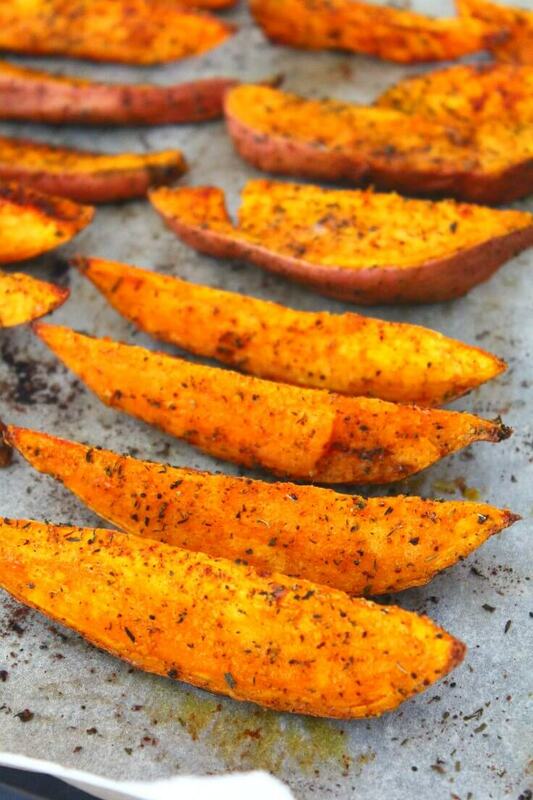 Stir in vinegar and pepper. I used wholewheat fusilli pasta but any wholewheat pasta would do just fine. Because I wanted my chickpea pasta recipe to be ultra quick I used canned tomatoes but if you have time, I would recommend using fresh diced tomatoes; taste better and are healthier than the canned version. You may have noticed I skipped the salt in my recipe; that’s because my canned tomatoes were salty enough. Check yours before deciding on adding salt. 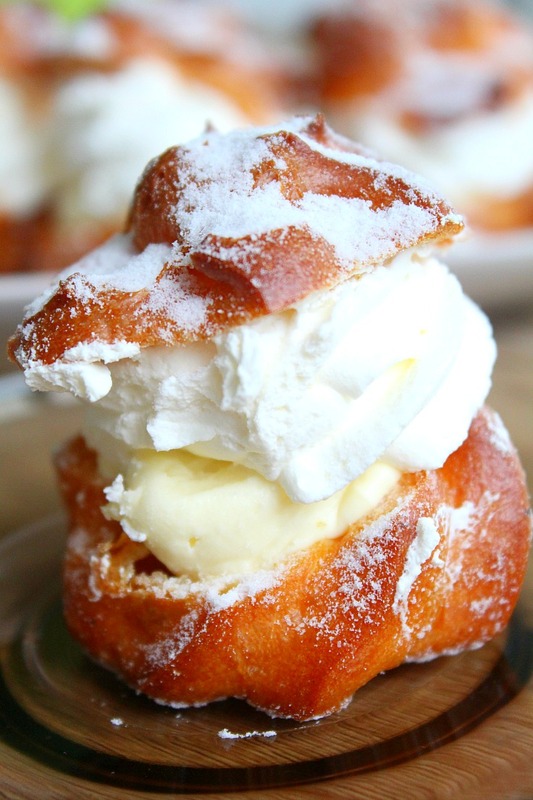 For this recipe I used olive oil as it’s my weapon of choice when it comes to making healthier options. 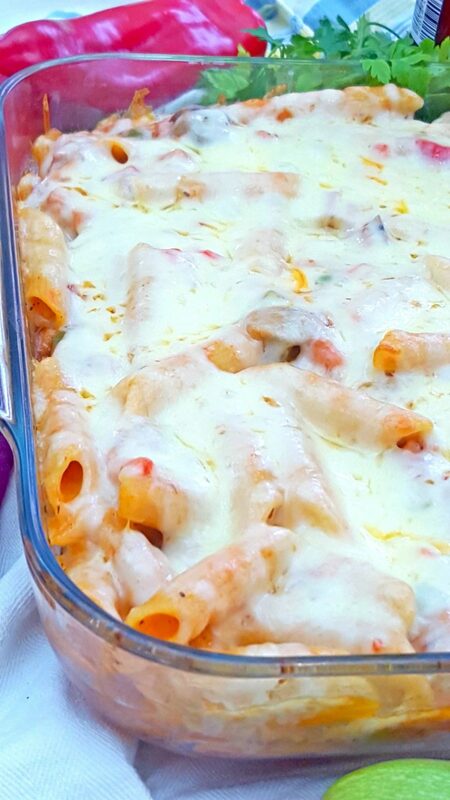 I also used fresh bell peppers and summer squash as they are not only easy to cook with (they don’t need a lot of cooking and taste great even just slightly roasted) but I find that taste great in tomato pasta recipes. 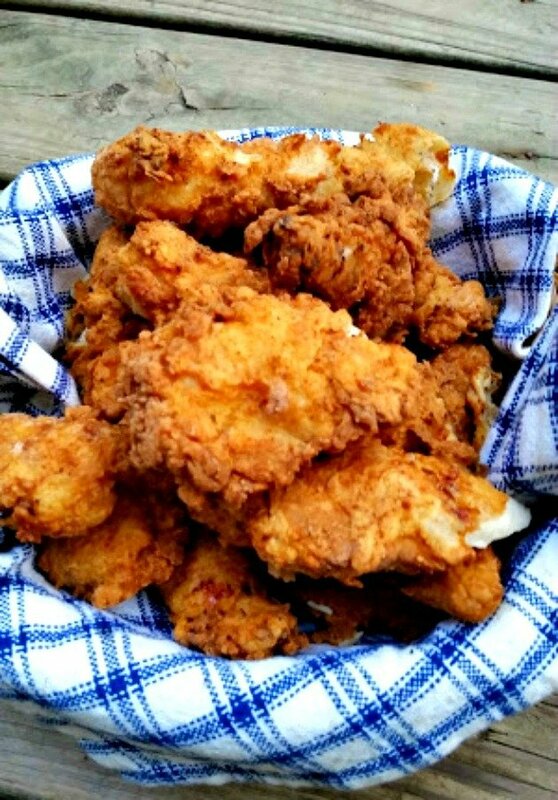 And since they don’t need a lot of cooking, they’re a little crisp and I love a little crispiness in all of my foods! As a huge garlic lover I, of course, had to add garlic. 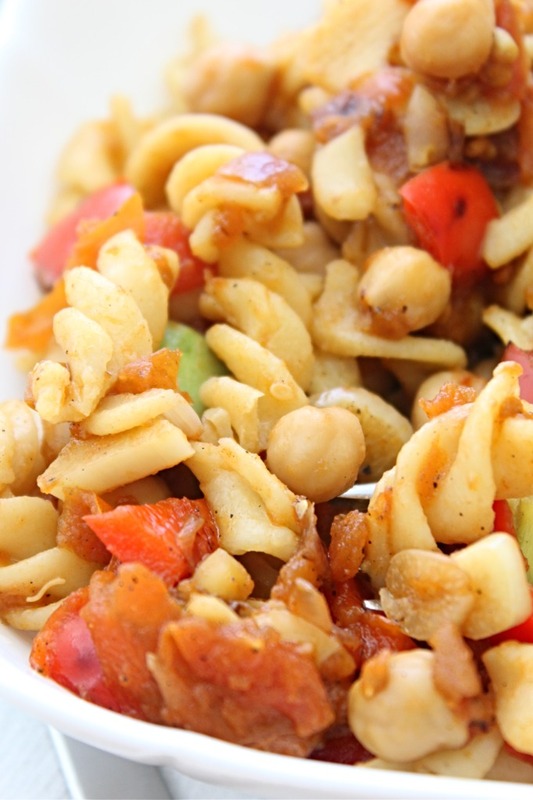 But for this pasta and chickpeas recipe I sliced the garlic instead of crushing as I normally do. For this reason, the garlic in this recipe is not very fragrant which doesn’t work that well for me. Next time I’ll crush the heart out of that garlic! 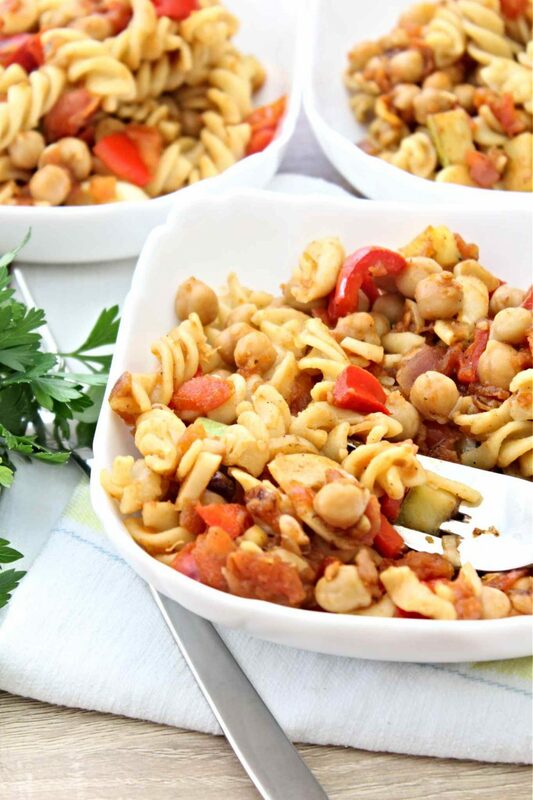 To add a little more Mediterranean flavor to this chickpea pasta recipe, feel free to add sliced olives and crumbled feta cheese when serving this dish!